Born in Tibet in 1963 , Chamtrul Rinpoche Lobsang Gyatso was recognized as the reincarnation of the second Katok Chamtrul Pema Nangsal Dorje Rinpoche, from Mardo Tashi Chöling Monastery, one of the branch monasteries of Katok. His first teacher was Naljor Yeshe Wangchuk Rinpoche, under whom he studied and practised Tummo and Dzogchen teachings intensively. Later he studied at the Institute of Buddhist Philosophy at Katok Monastery, after which he joined the shedra of Larung Gar Monastery at Sertar. 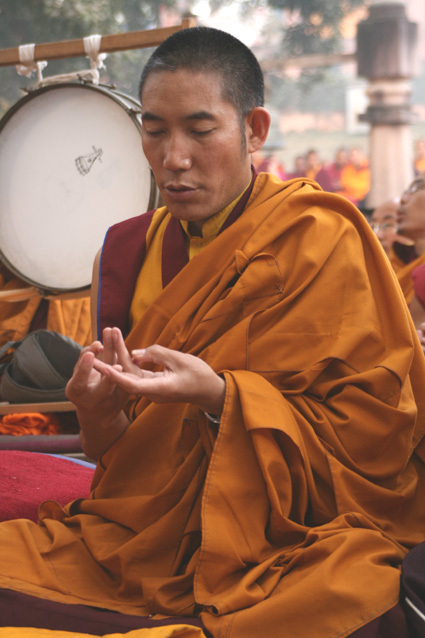 There, while studying under his root guru, Khenpo Jikme Phuntsok Rinpoche, he was awarded the degree of khenpo, and began to teach Madhyamaka, pramana and other subjects. When Jikme Phuntsok Rinpoche asked him to create a shedra in Mardo Tashi Choling, Rinpoche returned to his original monastery, where he taught and worked for the next six years. In 1999, he settled in Dharamsala, Northern India. There, Rinpoche teaches students from many different countries including Tibet. When not in India, Chamtrul Rinpoche travels around the world to teach his students in the US, Israel, Germany, Greece, Italy and Portugal. This page was last edited on 5 May 2015, at 13:22.